What is Cryptocurrency & the Blockchain? Cryptocurrency and blockchain technology is about much more than money and speculation. These inspiring new technologies are helping to create better ways of living for people and the planet as more and more industries are developing systems using blockchain. Learn why cryptocurrencies are cheaper, faster, borderless, decentralised, secure, and immutable. What is a Wallet and Why do You Need One? So, you’re interested in cryptocurrency and feeling excited about investing but then discover that understanding cryptocurrency wallets is a bit more involved than you might expect! Don’t worry we are here to decode the techie stuff to help you get started. A wallet is essentially a bank account for your cryptocurrency and the wallet address is like your account number. The sender of the cryptocurrency needs a wallet address so they have somewhere they can send the coin from, much like a bank transfer. This wallet is giving you access to the blockchain where you can view your balance, send and receive cryptocurrency. Wallet addresses tend to be around 30 characters long and consist of letters (both lower and upper case) and numbers. There are several different types: software wallets, hardware wallets, and paper wallets. Learn about the different aspects of each type on our Beginners Wallet Guide page. Jaxx Liberty is a FREE multi-currency wallet available as a desktop or mobile application across most operating systems, as well as via Chrome extension. See our video guide on setting up Jaxx Liberty on mobile devices. See our video guide on setting up Jaxx Liberty desktop wallet. See here for the official Jaxx support page. We suggest downloading the Exodus wallet on Windows or Mac. For the backup process on Exodus you need to make a deposit before being able to access a backup phrase. A ‘step-by-step’ wizard will then guide you through the backup process. See our video guide on setting up Exodus wallet. For more information visit the official Exodus website. We suggest the Copay wallet for IOS and Android phones. Once this is downloaded you will need to enter your email address which will prompt you to back up your wallet. You will need to write down this 12-word phrase on a piece of paper; do not store this digitally. To find your wallet address you will need to press the “receive” button if you are wanting to be sent coin from us (or from somebody else) and the “send” button if you are wanting to send coin to somebody. The QR codes allow you to scan via your mobile phone to copy the address, then paste into the area needed. For more information and support visit the Copay website. With XRP you’re somewhat limited in terms of choice of wallets, but we suggest the Ledger Nano S. The Ledger Nano S is a hardware wallet that you would need to purchase, and you use it like a USB stick by connecting it to your computer when you want to use it. Alternatively, you can use a free software wallet called Toast. It works on most devices and platforms. Interestingly enough it was developed by a Dunedin (NZ) based software company. It’s great to have a homegrown company leading the field! Ultimately, we suggest the Ledger Nano S for all coins. Visit their offical site to learn more about this wallet. It is most important that you have your wallet address handy when ordering coins. Every coin has a different wallet address, and we highly recommend that you copy and paste your address from your wallet instead of typing. Deal directly with a NZ based cryptocurrency retailer for simplicity, education and extra security. Choose from over 50 of the top crypto coins. Our retail trading process involves 4 simple steps to start trading! We do all the hard work behind the scenes to make cryptocurrency easily accessible to all Kiwis. Just like any retailer we have stock ready for you to purchase – there is no need for you learn about and go through the risks of dealing with multiple exchanges. All you need is an NZ bank account and the appropriate wallet set up. Once your verification has been approved you are ready to purchase your coins from BitPrime. We send your coins directly to your wallet because when you trade with us you are buying straight from our reserves. Unlike an exchange or brokerage, we don’t keep customer coins in our wallets – giving you extra peace of mind that your funds cannot be frozen, stolen or lost like they can be if an exchange or brokerage is compromised. The safety of your money is our highest priority! If you need help at any stage of the process, please don’t hesitate to get in touch – we are here to make your first purchase as easy as possible. Need help understanding and setting up your wallet? 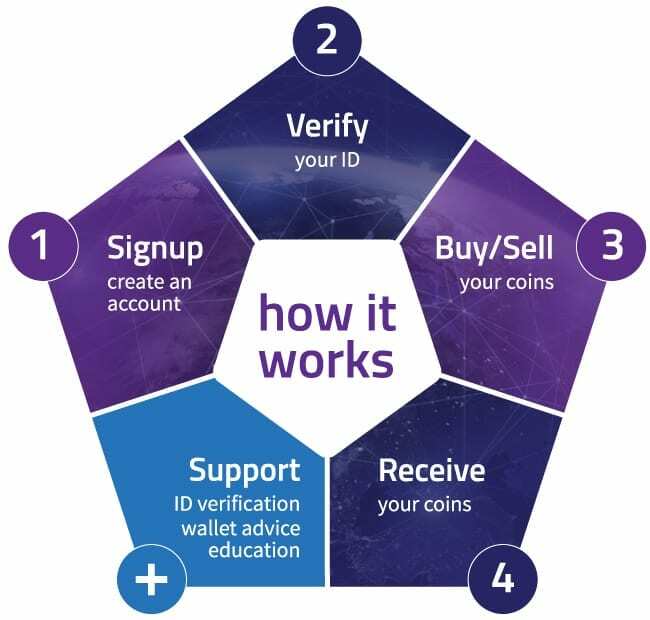 For more information see the section below on this page, or read more in our Beginner’s Wallet Guide. For our security and yours, we like to know who we are dealing with. We only deal with real people with legitimate intentions. As a professional financial services provider, we take security and fraud prevention very seriously. All new customers need to verify their ID before we will process an order. This is to meet our obligations under the Anti-Money Laundering and Countering Financing of Terrorism Act 2009. Much the same as a consumer bank, we are required to hold personal information about our customers. You will need: Proof of address, Photo ID, pen and paper, an NZ bank statement dated within the last three months. Our compliance list: Read through and check that BitPrime is the right trader for you – no cash sales; must have an NZ bank account; no third-party payments. Address – We need to make sure that you are a New Zealand resident or have lived in New Zealand in the last 3 months as we only buy and sell within New Zealand. This is also required from AML/CFT laws. Mobile – This gives us an extra layer of security by making sure it is you on the other end of the conversation. We need to make sure that it is you for your safety and ours. If someone hacks into your computer your personal details are at risk. It is easy for someone to retrieve a photo of you, so we require an ID selfie to prove that the ID matches the person we are dealing with. Furthermore, we ask for the time and date stamp ID to prove that the documents supplied are recent and not stolen off someone else’s hard drive. Many people have unencrypted ID documents stored on their devices that can be taken if the device is compromised by a hacker. Some people choose to pay from a joint bank account. If so, we need to know if a different name from your own will appear on the transaction. The last step is an opportunity to say anything further, or supply anything else that might support your application. Lastly – “SEND” your application and await approval to start buying and selling! What you see is what you get! Our advertised rates include all our fees, and the price agreed upon at the time of purchase is fixed regardless of what happens in the market. Our fees can be slightly higher than exchanges because we have done all the hard work for you – with education and support to help get you started, and no need for you to deal with multiple exchanges. In terms of fees they are not static due to the price of cryptocurrency constantly changing, this means that the fees depend on the time that you buy the crypto. There are a number of factors that determine our fees. Sometimes we trade at a loss, break even or net profit. Our fee structure is different to that of a brokerage or exchange. As a retailer, our expenses are generally higher than other NZ crypto traders. We have invested in professional, highly secure and legally robust operations – everything from our website, office space, several staff, education through original and reliable information, and branding. Although this means slightly higher fees, we believe our service offers you greater value and peace of mind compared to other NZ crypto providers. Also, we want to make sure customers have a reasonable understanding of the industry, wallets and coins they are interested in so they can feel comfortable placing an order. As far as we are aware no other NZ cryptocurrency brokerage or exchange offers an educational service like we do. Why is your price different to the price displayed on Google? The rate you will be looking at will most likely be from an international index in USD, then converted to NZD. It reflects the local price at some of the largest international exchanges in the US/Europe/China. They are not representative of local prices, just as the price of petrol or dairy products will vary from country to country. NZ tends to be priced at a premium to these international indices – but this isn’t uncommon, with Brazil, Japan, South Africa, and Korea all in a comparable situation. The flip side of the pricing premium is that you will get an above market price for your coins if you then sell them in NZ later. Is the price fixed or does it fluctuate? The price you pay is fixed at the time of ordering and that set amount of cryptocurrency will be sent to your wallet. Our advertised rates are updated every 15 minutes throughout the day. However, if you place an order but do not proceed within 24 hours, it will time out and you will need to submit a new order.